« Tried and True Vegan Recipes Series, Episode #2: Five Recipes From All Over The Blogosphere, Tested And Reviewed! Labor Day has passed, and you know what that means – fall recipes are beginning to pop up all over the blogosphere! Today I’d like to share with you the recipe for Tamarind and Kabocha Squash Soup that I recently came up with – but before you say to yourself, ‘Those ingredients sound way too fancy!’, bear with me for a minute: I’ve got some suggestions for easy substitutions down below. A couple weekends ago Rob and I visited Uwajimaya – the legendary Asian grocery store that has three locations in Seattle area and one in Oregon. I was amazed to see rows upon rows of green tea, seaweed, dried mushrooms, noodles, as well as some traditional Asian ingredients I’ve never heard of before. For a while, I’ve wanted to make tamarind soup after eating it a few times at Asian restaurants, so I made sure to find some tamarind paste brushing away the fact that I had no idea of what to do with it. Tamarind comes from pods of a tree that grows in Asia and North Africa. The pods contain seeds and red pulp that becomes sour once it’s dried. The pulp is widely used in Asian, Indian and Middle Eastern cuisine (you’ve probably tasted it before in hot and sour soup at Asian restaurants), plus it’s an important ingredient in Worcestershire sauce. 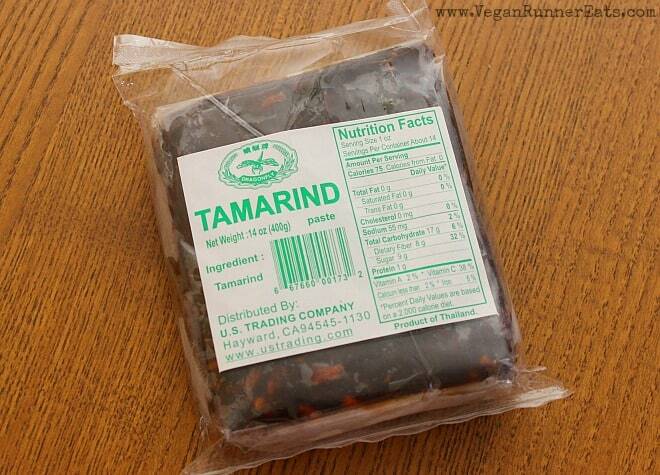 Tamarind pulp is loaded with vitamin C, so it’s ideal for clearing up some sinuses during fall and winter! To use it for my soup, I cut off about 1 Tbsp worth of tamarind paste, poured some hot water over it, and let it sit for 5-10 minutes while I was peeling and chopping vegetables. Once tamarind was soaked, I mashed it lightly with a fork to get all of the flesh off the seeds, and then strained it into a cup making sure not to pass any seeds. The resulting extract went into the soup at step 5 below. Kabocha squash is all the rage among some internet foodies because of its mild, slightly nutty flavor and buttery soft texture when cooked. I used only one half of this squash for my soup. As for dried shiitake mushrooms, I actually prefer them to the fresh kind because they are way less expensive, and can last for a long time in your pantry. Once I started searching for the perfect recipe to combine tamarind broth and kabocha squash, I stumbled upon this recipe for Butternut Squash and Coconut Curry, but decided to rework it and make it into a more filling soup. I omitted coconut milk completely to lower the fat content and substituted it with a larger amount of veggie broth, added some chickpeas for extra protein and fiber, skipped hot peppers because Rob and I prefer our food only mildly spicy, and used kabocha squash instead of butternut. Shiitake mushrooms were also added for texture. In case you’re thinking that the ingredients for this soup are unattainable in your area, no need to worry! You can easily use about 1 ½ cup of tomato sauce instead of the strained tamarind extract – you’ll have a different soup as a result, but it will be tasty anyway. Butternut squash and kabocha can be used here interchangeably. Shiitake can be substituted with sliced Portobello or crimini mushrooms – if you choose to do so, you don’t need to soak them, but make sure to add them only in the last 5 minutes of cooking the soup. 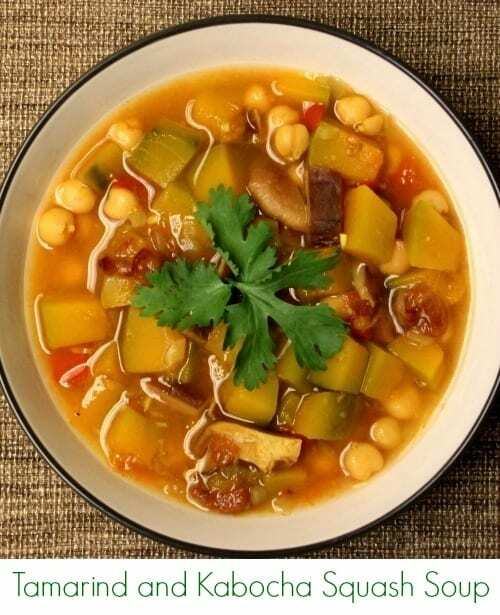 The fruity, tangy flavor of tamarind gives this soup an unusual flavor. Tamarind is rich in vitamin C, which makes it an ideal immunity booster. Throw a handful of spinach into each bowl for extra nutrition and texture. Cilantro, scallions, handful of spinach if desired. Put tamarind* paste into a small bowl, and pour 1 cup of boiling hot water over it. Let stand for 5-10 min while you go through the following steps of making the soup. Place dried shiitake mushrooms in a different bowl, and pour 1-2 cups of boiling water over them. Let the mushrooms soak until you need them later, for about 10 min. Note: if you are using fresh mushrooms, there’s no need to soak them. In a medium-sized soup pot, heat up 1-2 Tbsp of water until it gets bubbly. Add chopped onions, garlic and ginger, sautee for 3-5 min until the onion is translucent. Add all of the spices and a chopped tomato, stir gently, and cook for 2-3 min until the spices release their aroma. Meanwhile, peel and chop kabocha squash*** and slice soaked shiitake mushrooms into strips. Mash soaked tamarind* lightly with a fork while it’s still in the bowl with water, then strain it carefully into a cup making sure not to pass any seeds- you don’t want to break your teeth later while eating the soup! Some pulp passing through is ok. You should get about 1 cup of tamarind concentrate. Add kabocha squash, mushrooms, chickpeas, tamarind concentrate and 5-6 cups of boiling hot broth or water to the soup pot with onions and spices. 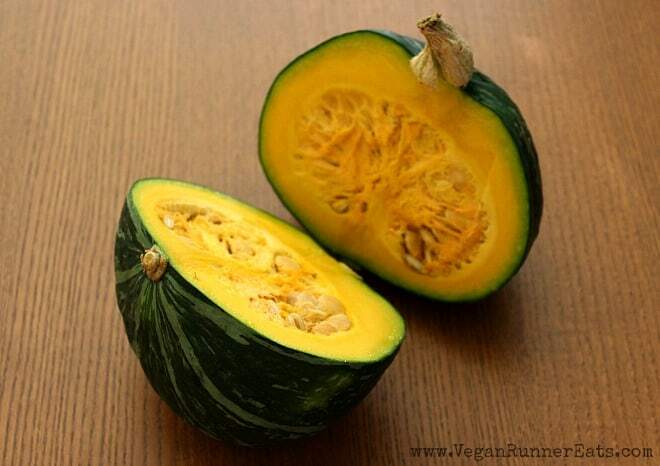 Bring to a boil, cover, reduce heat to a simmer, and cook the soup for 20-25 min, or until the squash gets soft. Add salt and pepper to taste, adjust spices. If the broth is a bit too sour to your liking, add 1 tbsp of agave or maple syrup. Let the soup rest for 5-10 min before serving. Garnish with cilantro and scallions, and add a small handful of fresh spinach to each bowl if desired – it will wilt under the heat of the soup right in the bowl. Enjoy! *In case you don’t have tamarind paste on hand, you can use 1 ½ cup of tomato sauce – no need to soak it. The soup will have a different flavor than if it was made with tamarind, but it will be tasty nonetheless. **Fresh shiitake mushrooms can be used instead of dried – if using fresh, there’s no need to soak them in hot water. 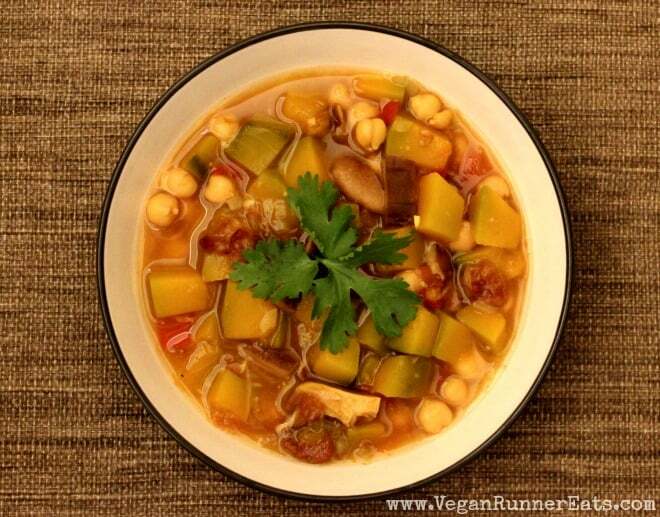 Alternatively, use crimini or button mushrooms, but add them within the last 5 min of cooking the soup. ***Butternut squash can be used instead of kabocha. Question for you: Have you recently tried any unusual/exotic ingredients in your cooking? What did you make with them? This recipe is featured in Virtual Vegan Linky Potluck #10 over here. Never miss another post: stay in touch with Vegan Runner Eats by subscribing in the top right corner of this post, or by following my blog on Facebook, Twitter, Google+ and Instagram! Tagged Asian cuisine, chickpeas, easy recipes, one pot meals, soups and stews, vegan dinner, vegetables. Bookmark the permalink. Thanks, Alina. I’ve had a block of tamarind stashed in the larder for way too long. At last, I know how to use it. Awesome Molly, let me know how your soup comes out! Bring on the fall recipes! I also have a package of tamarind languishing in my pantry. Now I can make this lovely soup! Glad to hear that, Terri!